Many consider Mike Piazza to be the best hitting catcher in Major League Baseball history and he certainly has the statistics to back it up. Beloved by fans for each of his teams, he reached superstardom while playing with the New York Mets and brought them to the brink of a World Series championship. 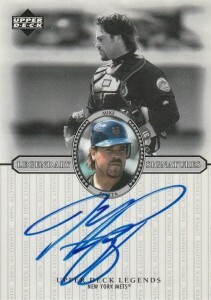 This top list brings together Piazza's best baseball cards from throughout his career. 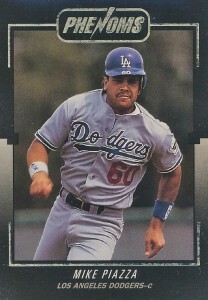 Shop for Mike Piazza Autograph Cards on eBay. Piazza built a career résumé that places him at the peak of many offensive categories for catchers. His 427 career homers leads all catchers and his ten consecutive Silver Slugger Awards is the record for players at any position. Just just surging at one specific point, Piazza was consistent throughout his career, hitting 30 or more home runs in a season eight times. His best season was in 1997 when he batted an amazing .362 with 40 home runs. While with the Mets, he had an impressive streak of at least one RBI in 15 straight games, falling one short of the record. Mike Piazza;s election to the Hall of Fame in the 2016 class is also impressive in that he now holds the record for lowest draft position by a Hall of Fame member. 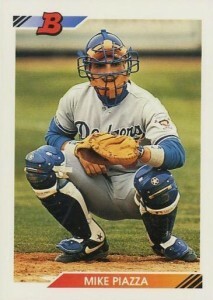 The Dodgers drafted him in round 62 of the 1988 draft. Outside of the cards featured on this top list, Piazza continues to be a very popular player and has been included in many recent sets. In 2015 alone, he appeared in popular Tops products like Topps Triple Threads, Tribute, Tier One, Stadium Club and for Panini in Prizm and Immaculate Collection. For fans who like a challenge in their collecting, Piazza was featured in both 2014 and 2015 Topps High Tek, giving collectors a formidable task to track down all the different patterns included in those sets. Piazza has also been featured in three Topps Allen and Ginter sets (2006, 2007, and 2014) wearing three different uniforms (Padres, A's, and Mets) and offering fans a chance to grab up many different mini card parallels. 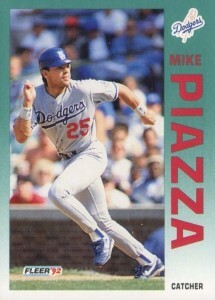 Because many of the Mike Piazza cards were produced during the era of mass production, the majority of his base cards are very reasonable for collectors on a budget. In formulating this top list, Piazza's rookies and other early appearances were balanced with some memorable autograph and relic cards in hopes of making a nicely structured and comprehensive collection. 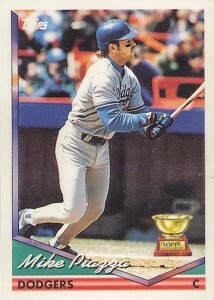 Rarely has a Topps All-Star Rookie Cup been so deserving as the one included on Piazza's 1994 Topps card. His full rookie year was remarkable as he batted .318 with 35 home runs and 112 RBIs. He was unanimously awarded the National League Rookie of the Year, receiving all 28 first-place votes. Fans from all five teams that Piazza played for in his 16-year career have the ability to find his jersey or bat relic cards. There is also quite a price range from his earliest relic cards while with the Dodgers to his final relics as a player with the A's. This bat relic from 2004 Fleer Ultra features a great photograph and is from Piazza's time as a player with the New York Mets. 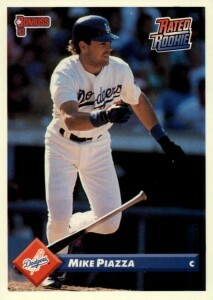 I personally collect Donruss Rated Rookie cards and Piazza's 1993 Donruss card is one of my favorites. The card highlights his brief 1992 season during which he played in 21 games and hit just one home run. He would ,of course, explode offensively the following season and win the NL Rookie of the Year. 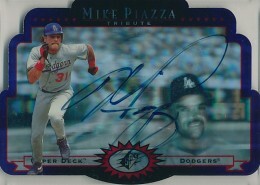 An excellent Mike Piazza autograph for Mets fans can be found in 2000 Upper Deck Legends set. The set's open design allows players a large signing area that could take up nearly half of the card's space. Mets fans can also find a sentimental value in owning Piazza autograph from 2000, as it coincides with their run to the 2000 World Series. 1993 Topps Finest Refractors give fans a chance to track down some truly rare cards in a period of high production. Refractors fell roughly two per box for this legendary product. That math works out to roughly each refractor having 250 copies over the entire print run of the set, which is an incredibly small production number for the time. For Piazza collectors looking for some gold foil on their cards, they should try to track down his Phenoms card in the 1992 Donruss The Rookies set. In total, there were 20 Phenoms inserts, with the first 12 cards (including Piazza's cad) found in The Rookies packs and the last eight in jumbo packs of 1992 Donruss. Los Angeles Dodger fans have many early autographs to choose from that feature Piazza in Dodger blue. 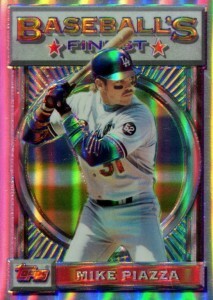 One of the earliest is this holographic card that can be found in 1996 Upper Deck SPx. Signing right on the hologram in blue ink, his signature is bold with the "M" and especially the "P" dominating the autograph. You might not expect it, but Piazza's 1992 Fleer Update card is one of his most frequently sold cards on auction sites. It makes sense when you consider the smaller print run of the Fleer Update series compared to the other sets that year. His card alone accounts for nearly the entire value of the 132-card Update release. 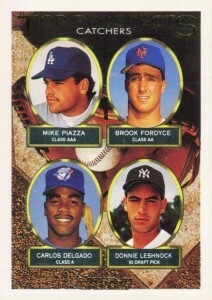 Topps issued their first Piazza card in the 1993 set and included him on a four-in-one catching prospect card. Piazza was featured along with future Toronto Blue Jays slugger Carlos Delgado, who hit more than 450 home runs during his career but didn't play many games at catcher. The combination of the two players makes it one of the most valuable cards from the 1993 Topps. Piazza's 1992 Bowman rookie card regularly battles another rookie, Yankee's reliever Mariano Rivera, for the most valuable card of the set. 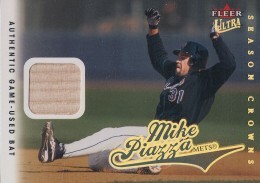 While Rivera's card has him famously wearing a polo shirt, Piazza's is clearly the better composed card with Mike catching some pitches in his gear. Gem mint graded versions of the card can approach $100 at auction. 2016 Topps Museum Collection Mike Piazza Gold Framed Silver Auto #d 4 15 Mets!